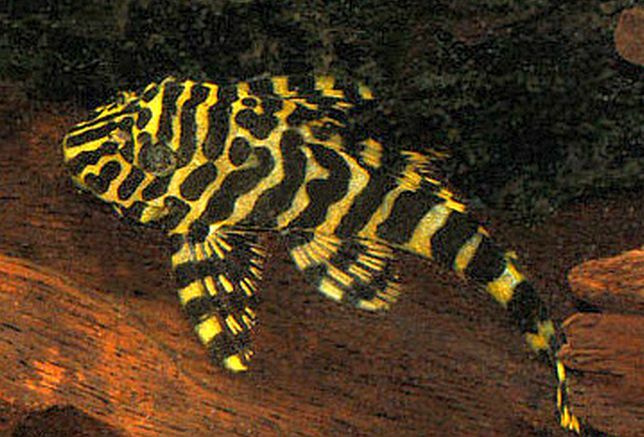 The Imperial Tiger Plecostomus L-134 (Peckoltia compta) is also known to tropical fish keeping enthusiasts as the Leopard Frog Pleco, Leopard Pleco or Tiger Pleco. Imperial Tiger Plecos are found in moderate to fast flowing water over rocky bottoms, as well as the still, slower moving waters and tributaries of the Rio Tapajós (Pimental) and Rio Jamanxim, Pará in Brazil. Most specimens are collected from the rio Tapajós, near the village of Pimental, downstream from the confluence with rio Jamanxim however, aquarium collectors also work the area in the rio Jamanxim around ilha da Terra Preta. Peckoltia compa are favorites of tropical fish keeping enthusiasts because of their small size. Adults only reach a little over 4 inches in length and are great candidates for peaceful community aquariums. 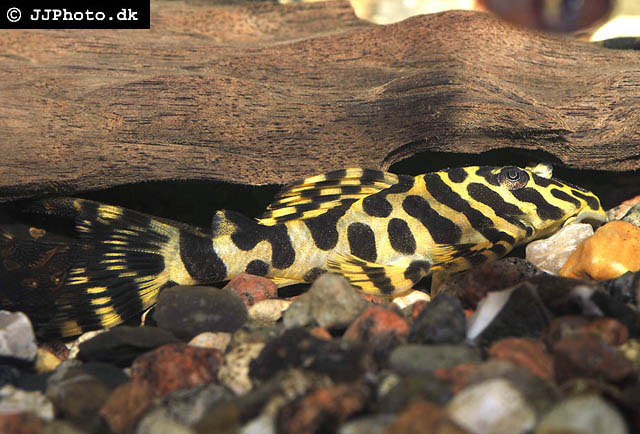 The Imperial Tiger Plecostomus or Leopard Pleco is a beautiful species that is relatively easy to identify. Juvenile specimens have a yellow background with a black to dark brown variably striped pattern. Older, more mature specimens are darker and display more stripes in the color pattern. This species is distinguished from all of its relatives by the clear stripe inside the dark brown bars running from snout tip to anterior margin of the eyes. Male Pecoltia compta develop teeth like odontodes on the leading pectoral fins and the back half of the fishes body. Females lack the odontodes and generally have a wider girth when measured just behind the pectoral fins and viewed from above. Given enough space and hiding places, the Imperial Tiger Pleco is peaceful and will come out during daylight hours to feed. The Imperial Tiger Pledcostomus (L134) is best kept with other peaceful species in a South American biotope setting in at least a 30 gallon tank with a fine gravel or sandy substrate, rocks (for caves), driftwood or bogwood roots, plenty of swimming area, and sufficient places for them to hide. Plants are not necessary but can be added for aesthetic purposes and cover however, because they are collected from highly oxygenated rivers in their native habitat, they do need well filtered water with a moderate degree of current and frequent water changes to keep them healthy. 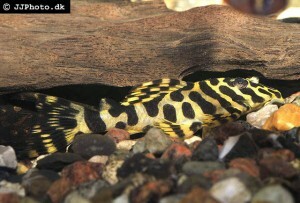 The Leopard Frog Pleco is a cave spawner that has been bred in an aquarium environment. Placed in a tank with a lot of rockwork or half of a clay flower pot, they will usually breed when an artificial change in season is induced. This can be accomplished by lowering the tank water temperature and increasing the quality and quantity of water with frequent partial cooler water changes. The females lay their eggs in a cave where they hatch out in about 5 to 7 days. The fry will be free swimming in 3 to 5 days and should be fed newly hatched baby brine shrimp and finely crushed flake food. Frequent water changes should be maintained during the rearing process. Leopard Frog Plecos are omnivorous but do not eat much algae. They should be fed a varied diet of sinking omnivore pellets or wafers, a quality flake food, and fresh, frozen or freeze dried bloodworms , tubifex , mosquito larvae, and brine shrimp. Lettuce, cucumber, peas and zucchini should also be offered on a regular basis. This is one species of plecostomus that also needs wood in their diet so bogwood or driftwood should be included in the tank decor. 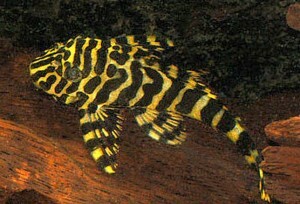 The Imperial Tiger Plecostomus or Leopard Pleco is not a common resident of tropical fish shops and when available demand a high price. When available they are usually 2 1/2″ to 3 1/2″ in length.